Cosy up on your sofa and have a go knitting your own Christmas decorations, either for on the tree or cluster them on a shelf or mantelpiece for a seasonal scene. There is a whole family of winter animal patterns are available for free from Rowan with their suggestion of Fine Tweed and British Sheep Breeds yarns. Penguin or polar bear, owl or rabbit, all are cute, and even come with their own accessories. 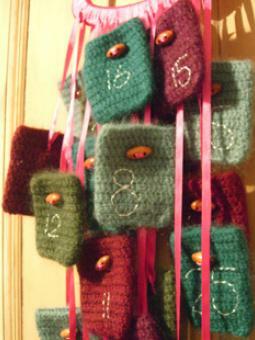 Or if knitting is not your bag, pictured is an advent calendar designed by Jemma Weston (pattern available for free from Rowan) to crochet and felt. It makes good use of all those odd bits of yarn you might have left. The calendar is a crochet and felting pattern. It can be saved and savoured for many years, and filled with little treats.